I finally broke down and ordered a copy of Railroad Tycoon and a copy of Formula Motor Racing (FMR) from Game Surplus. FMR is a light, quick, filler designed by Reiner Knizia known more for his more heady, lightly themed, simple yet elegant designs. FMR feels like something he would have designed in five minutes while taking his morning shower. 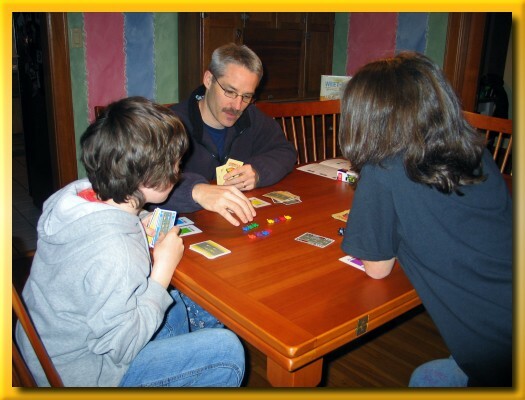 The game supports up to six players so it’s a great opener or closer. It consists of six pairs of cars in six colors, a deck of cards, and a 12d. All twelve cars are played regardless of the number of players. In the game above, each player was playing two different pairs of cars. The cars are always kept in a line on the table and players play cards which adjusts the order of the cars in the line and then draw a card. The goal is to be have your cars in one or more of the top six spots garnering points at game end. An official game lasts multiple sub-games determined before play begins. The cards consist of actions that advance a pair of cars, cause crashes, loss of position, etc. The game has great moments of Schadenfreude when players suffer the consequences of well timed card play. The kids seemed to relish the ‘oh yeah…well take that’ aspect of the game and after a quick round we set up for round two after a resounding “lets play again!”. I don’t have much to say about Railroad Tycoon yet. I opened the huge box, punched the bits, and set up the board to just see how big the thing really is. 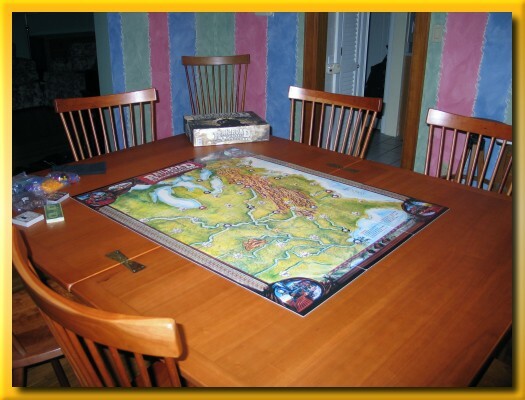 In the image above, the board has been placed on my dining room table and as you can see, the board is large enough that playing the game would be difficult with such a small amount of edge space. However, the neat thing about this table is that the entire top pivots towards one end of the legs and then the double thickness top opens up using hinges along the long edge (now in the center of the table). In its open state, the playing area is effectively doubled making a great space for playing this game. I’m really looking forward to tearing into this one. Lisa cajoled the kids into picking a family game this evening and we ended up with Ticket to Ride. There seemed to be a fair amount of grumbling from everyone early on about the initial two route tickets but we gritted our teeth and got to work. Lisa (yellow), Sophie (black), and I (red) were crowded in the east while Noah (blue) was initially free to roam in the west. As the game progressed, Lisa grabbed more routes and expanded westward while I had to settle for struggling for a newly obtained twenty point route across the northern border. Sophie ended up grabbing another almost completely overlapping route and Noah was struggling to weave his way through the tangle in New England to meet his initial two routes. In the end, Noah plopped down a four train route ending the game with only two remaining trains denying Lisa a chance to get a final white to connect her north west route with her southern route. 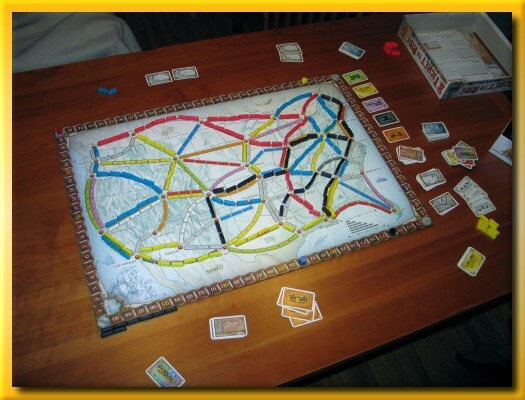 Ticket to Ride is a great family game and a great gateway to many of the more complex games I play on a regular basis. I’ve played TtR many, many times and grab for it when introducing alternative games for non-gamers or when wanting to play something relaxing & comfortable. If you’ve not given it a shot, take a chance on it and introduce your family to something new. I have several games on my shelf that I enjoy but rarely play and I organized an impromptu game night with the explicit goal of playing some of them. In my normal game group, we routinely stack up games and go through the process of deciding what game we’ll play given the number of people we have. We’ve had many discussions about splitting into two tables when we have six or more or trying to find something that we can play as a single group. We’re not overly organized and in general we try to stick together in a single game if possible. We routinely have at least five so many of my really great four-player games languish on the shelf. My goal was to get three or four players together and play as many games as possible on the following list: Reef Encounter, Tigris & Euphrates, Amun-Re, Notre Dame, and Caylus. Okay, so the last three can be played by five players but I also don’t get to play those games much and they’d still play well with three or four players. To get a quorum I invited six people since in the past impromptu gaming has a fairly low turnout. However, wouldn’t you know it that five of the six came so with me we had six. Initially I was bummed somewhat since my plan was really to play Reef Encounter and/or T&E and then anything else was icing on the cake. But, I decided to give up the fixed goal and just relish in the opportunity to play games with some great people regardless of what we played. 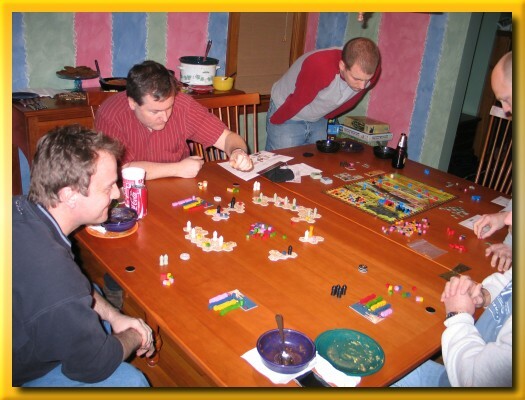 Initially we split up into two groups so I opened up the dining room table (effectively doubling the playing area) and on my end, I set up a three player game of Caylus with two new players. At the opposite end, the other three set up San Juan since two had played it before and the third was interested in learning. Caylus is a rather time consuming game to teach to new players (one of which is a relatively new gamer although he does pick up rules quickly). The lawyer wasn’t coming out so I rushed both the bailiff and the bottom king’s favor to grab the additional buildings after batching. I’d never participated in a a game that played out in that fashion and had a great time stretching some new muscles. Both Jason and Brian seemed to enjoy the game a lot and I’m sure they’d play again if asked. 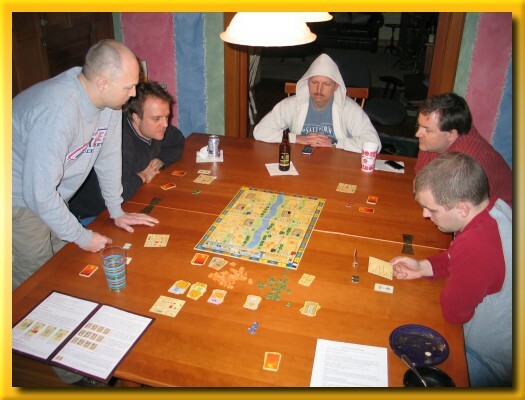 Before we could finish Caylus, San Juan ended and the far end of the table set up my copy of Carolus Magnus. CM is the leading candidate for my favorite three player game. I love the dual nature of the bidding chips that not only determine turn order but also determine the distance the king can move. 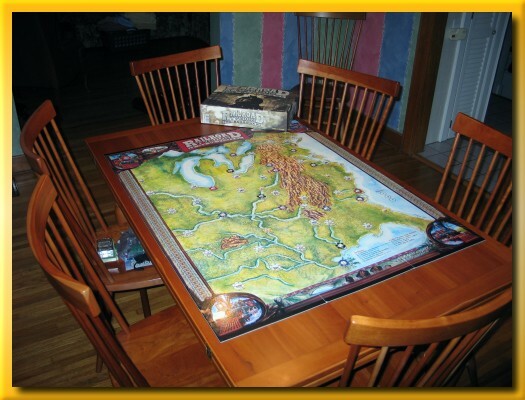 Add the tension of placing paladins in your court or on the territories and you’ve got a great recipe for fun. Carolus Magnus and Caylus finished at roughly the same time and Keith decided to sit out and browse the web on his iPhone. With five, we set up Amun-Re and after running through the rules to the four new players, we got started. The first round was rather uneventful but by the end of the old kingdom I think everyone was moderately interested. It had been a long time since I’d played and I have to say, I was somewhat disappointed in the game. My previous plays had been fun but this time I was finding it much more fiddly than I remembered. Juggling the power cards and the money cards, making change, buying and placing farmers, swapping bricks for pyramids, making sure people got their free stuff from the provinces they’d won during the auction phase, etc. It just felt tedious. We played out the game but I must say that we did discuss only playing the first kingdom. In general, everyone felt the game was okay but it just didn’t light any fires in anyone. To Free or Not To Free? That is the question. I was contacted recently by a PHD student of Mathematical Statistics and a lecturer of Computer Science topics in South Africa. He is on a quest for a project for his advanced students and he suggested that my Ingenious implementation provides a unique opportunity for creating bot logic without having to design and/or implement a user interface. The bot implementations answer these questions by navigating their own copy of the board and by using those objects (and their corresponding data structures) make their decision based on a weighted analysis of options. The final answers are derived and returned to the core game logic and play continues with subsequent players. The human player implementation overrides these methods by simply passing control to the user interface for the human to answer. Once answered, the selections are returned to the core logic in the same fashion as the bot and play continues. The core game logic is neither aware nor interested in distinguishing human players from bots. I’m flattered by the request and relish the idea of being part of the project. However, after some thought I respectfully declined the offer. My reason for implementing Ingenious was not to provide the best bots and/or online experience for the game. The best experience you can have is with the physical game and I openly encourage those who like the game to purchase a copy. By submitting my code to the project I feel that I would lose control of the implementation and would be unable to remove it from the web if requested by the designer and/or the publisher. I also feel that I would indirectly contribute to potentially multiple implementations were the code morphed and published on other sites. Author mattPosted on January 22, 2008 January 27, 2016 Categories All Posts, Board GamesLeave a comment on To Free or Not To Free? That is the question. 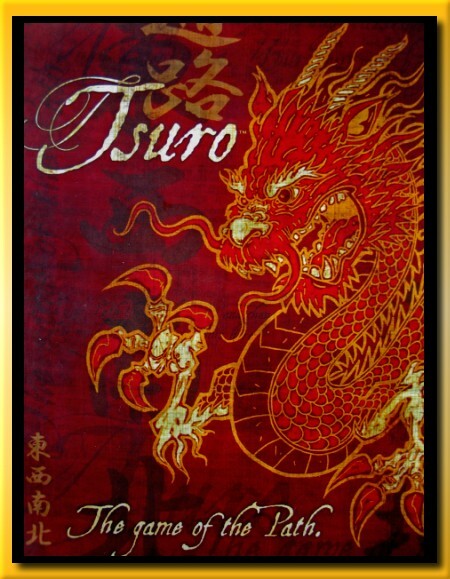 Tsuro is a tile laying game for 2-8 opponents played on a 6×6 grid of squares. Each grid square at the edge of the board is marked by two white hash marks. Each player takes a token in the color of their choice and begins the game by placing it on one of the 48 white ‘hash marks’ at the edge of the board. 71 unique tiles are shuffled and each player receives three. A single tile depicting a dragon is set aside for later in the game. Play begins when the starting player places one of her three tiles ‘in front of’ her token. After placing the tile, all tokens that can follow the path across the new tile must do so and follow the path until reaching the edge of a tile or the edge of the board. A user’s turn ends by drawing a new tile to replace the tile played. The goal is to be the last player with your token remaining on the board. You are immediately eliminated from the game if at any point a tile forces your token to follow a path off the edge of the board. 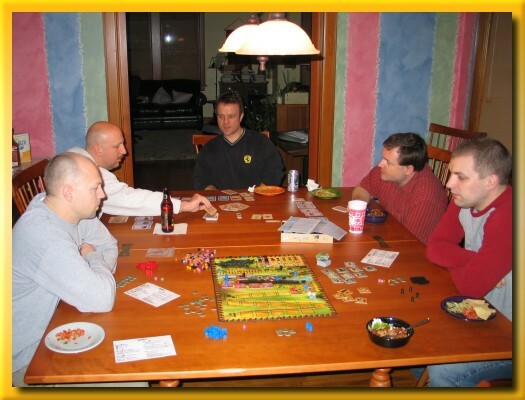 The player forcing the tokens from the board is then free to swap any number of his tiles with the tiles the eliminated players have. After the swap, remaining tiles are shuffled and placed under the draw pile. If at any point the draw pile is exhausted, the first player requiring a tile takes the dragon tile instead and play continues with less than three tiles. 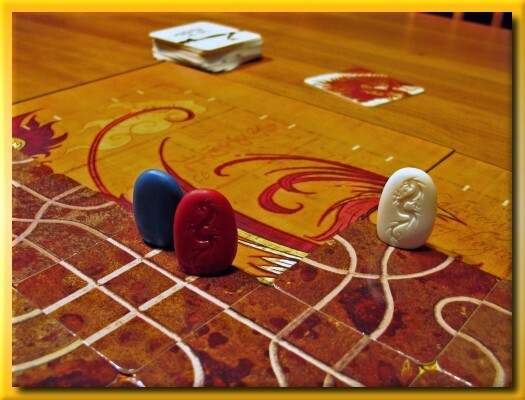 Then, when a player is eliminated and more tiles become available, the player with the dragon tile returns it to the edge of the board and draws one of the new tiles. Continuing clockwise, players draw replacement tiles until the draw pile is exhausted or all players have restocked to three. As done previously, the first player that cannot fully replenish their hand of three tiles, takes the dragon tile. You must place the tile in front of your token which means your token must move on your turn. By placing a tile next to your token and another token you can force another player’s token to move in addition to yours. All tokens must move to the end of the path after every tile is placed. Players are not allowed to ‘commit suicide’ unless forced to do so. Players are eliminated whenever their token follows the path to edge of the board or crashes head-on into another player’s token. If the final tile eliminates all remaining players, the game ends in a tie. 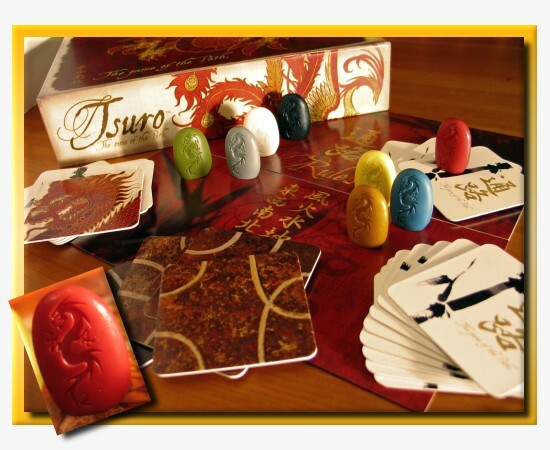 Tsuro’s artwork and theme are awesome. The color scheme is rich. The artwork is carried through to every facet of the game from the trifold rules to the tile backs, from the unpopulated board to the tile fronts, from the box art to the paper dust liner in the box. In general the components are well made. The tiles, although a little thin seem to hold up nicely, don’t seem to warp easily, and are relatively easy to pick up when placed flat on the table. 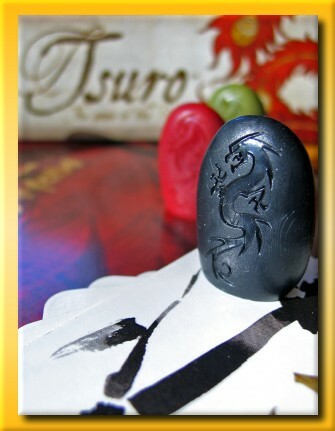 The tokens are plastic resin based and include a dragon stamp. Plexiglas tokens (like Samurai) would have been very nice though. The box is somewhat thin and I can already feel some compression just inside the edges. The dragon tile artwork appears somewhat blurry. I’m unsure if this was an error during manufacturing or purposeful. 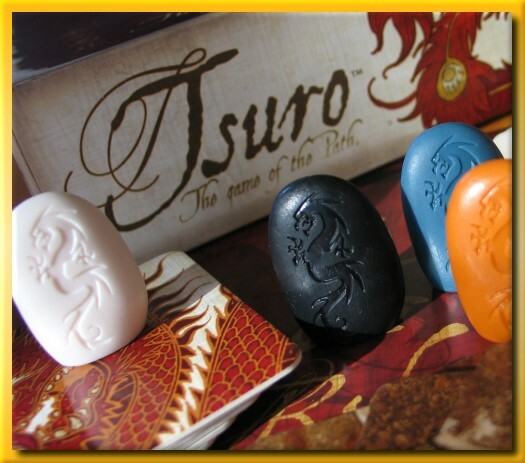 Tsuro’s rules are straightforward with the exception of the explanation of the dragon tile. The rules present a convoluted litany of descriptions of where to place the dragon tile in various circumstances that lead to confusion. The mechanism by which players would have less than three tiles is far from clear. I had to peruse BGG to understand that the dragon tile should just be set to the side and used as an IOU for the first player that needs tiles. Tsuro is at best a chaotic filler. This Metro-like game somewhat plays itself in that players have few major decisions to make. Play is very tactical. When tokens are distant from one another play is uninteresting. When tokens are in close proximity, play is unpredictable. I cannot imagine the game with all eight opponents. With three players the game only lasted about 15 minutes so being eliminated early through no fault of your own isn’t too much of a concern. The artwork is so well done I really wanted to like the game. Unfortunately I just couldn’t find the game in there anywhere. This morning, my mission was to coerce several coworkers into playing Taluva with me after lunch. Successful in my mission, the three of us ate a quick bite and I made quick work of explaining the rules. The game is deceptively simple. 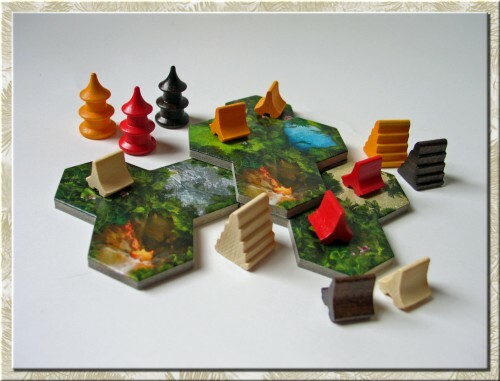 Each turn, you draw and place one of the small but extremely thick tiles (a connected set of three small hexes depicting an erupting volcano and two, potentially identical, terrain types (water, stone, sand, jungle, or grass) followed by building one or more of your wooden bits (hut, temple, or tower) in any valid location on the land mass (not limited to the tile you just placed). Your goal is to build all of two of the three kinds of bits before the tiles run out. If that does not occur, the winner is the player who has built the most temples. Ties are broken by the most towers and then huts that have been built. Tile placement is governed by a few simple rules. Firstly, you are always allowed to place the tile directly on the table (level 1) and abutting the rest of the tiles so that at least one side touches the rest of the land mass. Secondly you can also place tiles on top of the land mass (levels 2, 3, etc.) as long as the volcano on your tile overlaps a volcano on the tile below it and the tile doesn’t align exactly with the tile below it. The number of volcanoes covered is irrelevant. You’re also allowed to crush other players huts (removing them from the board) as long as you do not completely destroy the entire settlement (a group of adjacent huts, towers, and temples). Temples can be placed in settlements that cover three or more hexes and that do not already contain a temple. Towers can be placed adjacent to an existing settlement that does not already contain a tower on level 3 or higher. Settlements are allowed to merge even if doing so causes the new settlement to contain multiple towers and/or temples. A single hut can be built on level one anywhere on the land mass or a player can also expand an existing settlement. Settlement expansion requires the player to choose a terrain type (e.g. jungle) and then locate all of the unoccupied matching types directly adjacent to the entire settle boundary. For each unoccupied and matching hex, the player places the number of huts equal to the level of the hex. You are required to build every turn and if you cannot…you lose. That’s it in a nutshell. The game is an extremely tactical spatial exercise. The three dimensionality of building up without granting opponents clear opportunities is a clever twist of mechanics. The game hinges on determining how and when it is the best time to squash your opponents settlements and how best to set up your own settlement placements to make every move count. Those players that can make individual moves benefit multiple settlements while hindering others will come away winners. The randomness of the drawn tile does, at times, determine the winner. I’ve played several games when drawing a tile with a particular terrain type would have granted me a win. However, the luck aspects don’t overwhelm the game in my opinion. My lunch group played well and I was almost taken by surprise by the player to my left on an expansion move that amazingly left him with only one hut and his original two towers. The player to my right needed only another turn or two to win but I managed to pull out the win with only three or four tiles remaining. I really enjoy Taluva. It’s one of my favorites. In general, I don’t pay much attention to professional or college sports. I was, however, glad to hear that my alma mater pulled out a bowl win even if it was accomplished with a score rivalling some basketball games. Living in Columbus, Ohio I get soaked in The Ohio State scarlet and gray marinade on a daily basis and a little goes a long way. Yesterday the office was a sea of red jackets, shirts, and jerseys. The cafeteria staff were even wishing everyone a great time watching the game. We decided to hold a game night “light” to watch the big game while playing some lighter fare. We arrived at Keith’s house for a semi-abbreviated gaming experience playing Samurai for the first 45 minutes and then we began watching “the game”. By halftime we’d pretty much determined that the Buckeyes were going to three-peat on losing national titles in only two years across two sports. During the second half of the game we played Ticket to Ride Europe while half watching from the kitchen area. What a sad day for Tressel and his Buckeyes. I haven’t seen much black attire at work so far this morning but the mood is heavy and depressing.